In case you have not noticed already, Auphonic now supports Amazon S3 and Archive.org as external services. Archive.org, also known as the 'Internet Archive', is a great service for publicly hosting audio and video files for free. Amazon S3, on the other hand, provides both free and affordable services for public or private file storage, featuring better download speeds and high durability. S3 also interfaces with Glacier, Amazon's cheap solution for long-term archiving and backups of data that does not require rapid access. Any audio/video files that you create with Auphonic can automatically be deployed to your Amazon S3 and Archive.org accounts. You have to upload your original file only once, and Auphonic will do the rest. Also, you can use any file on your S3 or Archive.org account as the source file of an Auphonic production. In this article, we will discuss both workflows and how to set up Amazon S3 and Archive.org support for your Auphonic account. If you need a generic S3 interface (not Amazon), please read this blog post! First, you have to add Amazon S3 and/or Archive.org to the External Services page of your Auphonic account. To do so, you will need to retrieve your access key and secret key from Archive.org or from Amazon S3. These keys allow Auphonic to add files to your third-party accounts in a secure and confidential manner. For Amazon S3, there is some additional work to do. 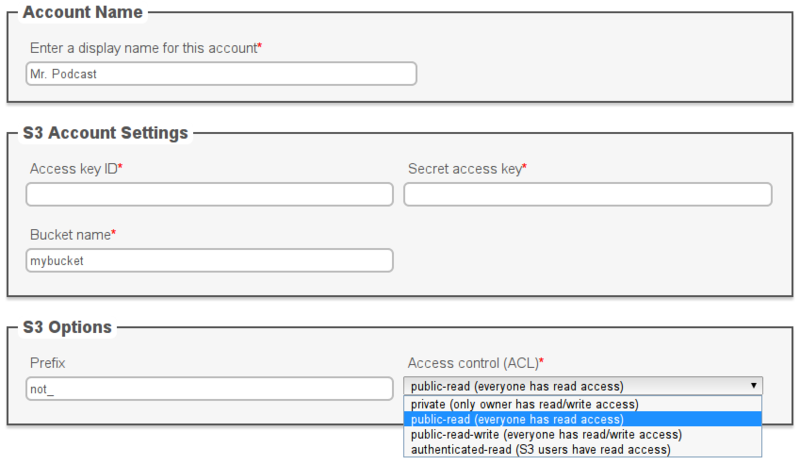 By contrast to Archive.org, where all files are world-readable, you can choose from various access control (ACL) setttings, which determine who can and who cannot read from and write to your files. See the screenshot below for a quick overview of available settings. In addition, you need to specify the name of a bucket on your S3 account. For example, a file my.mp3 in a bucket called mybucket will be accessible at http://mybucket.s3.amazonaws.com/my.mp3. Bucket names need to be unique worldwide; two different S3 users cannot create a bucket with the same name. Note that the bucket needs to already have been created, for example through the S3 Management Console, or else Auphonic will throw an error message. You can also specify an optional prefix that will be prepended to the name of every file in the given bucket. For example, with the settings from the screenshot above, a file my.mp3 will eventually end up at http://mybucket.s3.amazonaws.com/not_my.mp3. The prefix can be used to simulate folders inside a bucket, for example, if you set the prefix to "my-folder/" and the filename is my.mp3, the final URL will be http://mybucket.s3.amazonaws.com/my-folder/my.mp3. You can now add Amazon S3 and/or Archive.org as an outgoing service to an Auphonic production. After Auphonic has optimized the audio in your production and encoded it to your preferred combination of output formats, the resulting files will automatically be uploaded to your third-party account(s). In other words, you still have to upload each file only once, except that you upload it to Auphonic rather than directly to the external service. Note that you cannot easily delete any files on Archive.org once you have uploaded them. For any files uploaded to Archive.org, an HTML page will be generated on their website, through which your files are accessible by the public. If you upload the files yourself, you will have to manually fill in all details such as title, summary, or licensing information. But if instead you let Auphonic upload your files, this information will be filled in automatically from the metadata in your Auphonic production form! :) Our Archive.org example page has been entirely auto-generated in this manner. In case you are not already using Auphonic to automatically encode your media files to multiple formats, Archive.org provides a similar feature. For example, smaller copies of large video files are automatically created, and for every MP3 that you upload, an OGG file will also be generated. The Archive.org FAQ lists precisely which audio and video formats will be created for any valid input format. You might want to distribute your podcast via bittorrent to provide your listeners with better download speeds. Archive.org conveniently generates a torrent file for each set of files that you upload together. A similar free service is provided by Bitlove, which creates and seeds torrents for all media files enclosed in an RSS/Atom feed. You should be aware that you cannot update your files on Archive.org by re-running an Auphonic production. Instead, a second HTML page will be created for a new set of audio/video files under a slightly different URL. As with other external services that we support, you can also use your files on Amazon S3 and Archive.org as the source of an Auphonic production. All Amazon S3 files, no matter what their permissions are, can be added through a distinct upload method in the Auphonic production form. Files that are publicly readable can also be uploaded via HTTP under 'Select Upload Method'. This includes those files on Amazon S3, for which you have set according permissions, and all files on your Archive.org account.